WG Locksmiths Ltd. is a local, mobile, trustworthy and professionally run business operating in the South West London (SW) and South East London (SE) areas, as well as in surrounding areas such as: Bromley (BR) and Croydon (CR). We are CRB checked, fully insured and Master Locksmiths Association trained company. We offer highly specialized and trustworthy service affordable for all our customers. WG Locksmiths Ltd. provides competitive rates, as well as free surveys and estimates. 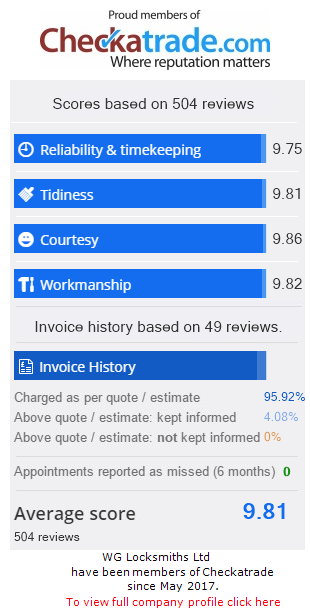 We do not charge on the grounds of hourly rates and we do not call out charges. We offer a wide range of locks to be installed in the cars from leading industry brands including ERA, Union, Yale etc. We are usually able to provide suitable locks on the job, therefore it is possible to complete the job during just one visit. We can unlock your door and get you back into your property. WG Locksmiths is the official installer the most secure locks in UK. This lock suit well to all multi – point locks and provide the highest rate of security to your door. As well as being approved by the Police and achieving the highest Kitemark star rating Ultion is tested by locksmiths with the Master Locksmith Association and is accredited with their highest standard. Sold Secure Diamond. Furthermore You can activate your free £1000 guarantee & Key Control. The ultimate add-on for your Ultion keys – KEYRING. Using the free app your smartphone can guide you toward a lost Ultion key in moments. Whether you are locked out or locked in your property? Whether you are being burgled or you lost your keys? Those situations can be stressfull so you need trustworthy and fast locksmiths services you can rely on. Call us immediately so we will provide you a reliable and professional service. There are many reasons why you should change the locks immediately after buying a property. Do you know how many sets of keys were cut before and who has got them? If your locks are in compliance with the British Standard 3621:2004, now a requirement of most insurance policies? Does your property have proper security? Could you exit through all doors and windows in case an emergency? Do you have keys to all your doors and windows? Do your locks working properly? Are there some of the locks broken or damaged? Call us now on 075 1413 1054 and book free survey and estimates. WG Locksmiths provide a professional lock fitting and replacement service for all types of doors and windows, as well as garages, letterboxes and others. We can provide a free site survey and will be able to make recommendation's to comply with your home insurance policy and how to upgrade your locks to minimalize risk of burglary.